Our inspiration for the Spring Summer ’15 Green Label collection came straight from our favourite British seaside towns and the thrill of 60’s bank holiday mayhem. The legendary Mods and Rockers rivalry that grew during the 60s and exploded onto British seafront towns in a series of infamous riots. Classic Polo Shirts and Deansgate Parkas stand up alongside lightweight casual jackets that channel a hybrid of 90s Britpop and technical, functional design. Also, back by popular demand, our much loved Monkey jacket, available in brand new colourways. 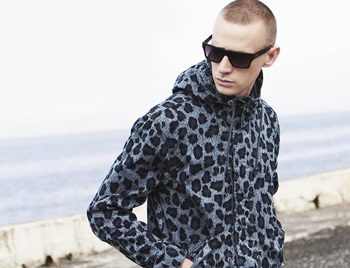 Highlights of this season include our new Camo Leopard print which injects a touch of 21st century hi-energy colour into our summer Parkas, our brand new tonal paisley Seaforth Bomber Jacket and a selection of bold graphic tees designed by hand by our design team’s resident artist.